A Good Man Goes To War provided some answers, left others unanswered, and ended with a cliff hanger which might carry through the entire second half of the season of Doctor Who. American audiences watching on BBC America remain a week behind, learning in The Almost People that Amy was a Ganger and not really with the Doctor for quite a long time. The Almost People was discussed here, and this contains major spoilers for those who have not seen A Good Man Goes To War. Kidnapping Amy and her new born daughter Melody provided reason for the Doctor to gather those who owed him favors and go to war to rescue them. The Ganger technology used by Amy’s kidnapper, Madame Kovarian, was clearly far more advanced than that used in the previous two episodes, extending through time and even beyond our universe. Amy probably had been kidnapped before the events of The Impossible Astronaut. Unlike the Gangers who became independent beings in The Rebel Flesh, Amy’s Ganger remained linked to the real Amy, who awoke when the Doctor destroyed the Ganger at the end of The Almost People. It was necessary for the Doctor to destroy Amy’s Ganger so that Madame Kovarian would not know what the Doctor was planning. The rescue, like many Doctor Who plots, had many holes in the story and was written to throw in as many ideas as Steven Moffat could possibly fit in. This included a wide variety of beings recruited to assist the Doctor, the most interesting being Commander Strax, a Sontaran punished by being turned into a nurse and forced to have compassion for the weak, plus Madame Vastra, a lesbian Victorian Silurian. Huge Vonneville’s pirate and his son from The Curse of the Black Spot had a quick appearance, but it is questionable what real assistance they would have provided. The kitchen sink extended beyond the Doctor’s allies. The fat and thin gay married marines were quickly introduced, only to have one beheaded when “recruited” by the Headless Monks, and the other was forgotten. The Headless Monks have been mentioned when the Doctor and Amy visited a museum in The Time of Angels, part of the vast continuity to the series provided by Moffat. Lorna Bucket also seems to have entered and left the Doctor Who universe far too quickly. The episode provided the final teases that the father of Amy’s daughter might be the Doctor’s before firmly establishing that Rory was the father. Her daughter had both human and Time Lord DNA due to having been conceived while the Tardis was in flight. We also learned an interesting, if not crucial fact about the Doctor. Not only does the TARDIS enable him to translate the language of any planet he is on. He can even speak “baby.” I wonder if he can also communicate with my cats. The key thing we learned from this episode is that, as the only water in the forest is the river (previously noted by Idris in The Doctor’s Wife), River gets translated to Pond. In addition, Melody becomes Song and the names are reversed. Therefore Amy’s daughter, Melody Pond, is also River Song. This certainly explains why River could pilot the TARDIS. This also explains why River could not appear until the end of the battle of Demon’s Run, or at least until the real Melody was taken away. She could not overlap with her own time line. 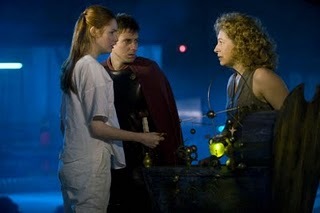 I wonder if rescuing Melody will mean the end of the Doctor’s relationship with River. It is also not clear where on the Doctor’s personal time line the implied romance with River took place. Is this why River ultimately kills “”the greatest man I ever knew, ” assuming that it was the Doctor that she killed? Perhaps she killed him as a child in the astronaut suit in Day of the Moon for reasons which at this point are totally unclear. Now that the Doctor learned about his upcoming “death” from Amy in The Almost People, he is presumably making preparations and this was all part of some huge plan. I suspect we won’t really understand what happened in that scene until the end of the season, which is also likely to be the end of Amy and Rory’s time with the Doctor. The cliff hanger to end the episode was the Doctor going off to rescue Melody. 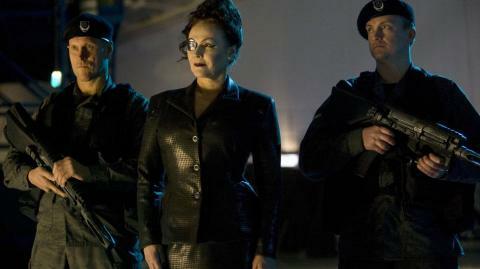 It was not a traditional cliff hanger as we know that Melody Pond/River Song will be rescued. I bet that Moffat ended this portion of the season in this manner to leave us questioning how all this fits together. Successful cliff hangers, from who shot J.R. on Dallas to the ending of Best of Both Worlds on Star Trek The Next Generation benefit a show when they keep the fans talking and speculating until the answer is revealed. It looks like a lot remains to happen to Melody before she is ultimately rescued. It appears from The Impossible Astronaut and Day of the Moon that the Silence become involved, she is trapped in a space suit, shot at by her mother, and has the strength to bust out. It appears that she escapes and is on her own, making it to New York City where she regenerates. The season resumes this fall with an episode entitled Let’s Kill Hitler, suggesting the search for Melody Pond is a journey through space and time, also to involve the 1960’s as seen in Day of the Moon.